An all-round team effort by Australia saw them clinch their fourth ICC World T20 title as they defeated England by 8 wickets in the final. India crash out after collapsing from 89 for 2 to 112. Knight, Sciver and Jones lead England into final. Australia bury ghosts of 2016 with 71-run demolition of West Indies in semi-final. Mandhana, Harman and spinners demolish Australia 48-runs as India top Group B.
Indian spinners help the India beat Ireland by 52 runs and women in blue qualify for Women World T20I semi-final. Veteran Mithali Raj guides India to 7-wicket win over arch-rivals. The skipper became the first Indian woman to crack a ton in T20Is. The host beat Bangladesh by 60 runs in their opening game in Women World T20. Australia opened their ICC World T20 2018 campaign with a 52-run win against Pakistan. Hamanpreet Kaur hit a six and ran briskly for two runs during the last two balls to steal a tense one-wicket win for India over South Africa in Colombo on Tuesday. Indian women maintained their supremacy in the Asia Cup by beating arch-rivals Pakistan for their sixth title on 4 December. The India women's team edged past West Indies by 15 runs in the third ODI at Vijayawada. Rajeswari was the pick of the bowlers with figures of 4/21 while Ekta Bist chipped in with 3/14 in 8 overs. India women chase down Australia's 141 in Adelaide, the highest target chased against the hosts. Captain Mithali Raj stars as India beat England by six wickets on the fourth day of the Women's Test at Wormsley. The Indian women's cricket team lifted the inaugural Asian Cricket Council's Twenty20 Asia Cup after beating arch-rivals Pakistan by 18 runs. England women defeated India by three wickets in the fourth ODI to level the five-match series 2-2. Having lost the first 2 ODIs, English women won back to back matches. Indian women's hopes of clinching the series in the third ODI were dashed as hosts England pulled one back with a three wicket victory, on Thursday. Goswami bowls India to 14-run win over EngJhulan Goswami wreaked havoc as Indian eves beat England by 14 runs in a low-scoring second ODI, on Wednesday to take 2-0 lead in the five-match series. England's women beat India by eight wickets at Chelmsford to win their Twenty20 series 2-0 on Thursday. Goswami helps India beat New ZealandJhulan Goswami led from the front to help India beat New Zealand women by three wickets to finish third in the NatWest Women's T20 Quadrangular Series. The Southern Stars have suffered a 16-run loss to England in the final of the Twenty20 quadrangular series at the Rose Bowl on Monday night. It was Mithali's unbeaten 51 that laid the foundation of India women's 15-run victory over West Indies in the third Twenty20 match and clinch the three-match series. India's Mithali Raj continues to dominate the ICC rankings chart, while West Indian Stafanie Taylor rises to second spot in the table with a consistent all-round performance. A vital knock of 47 by lower-order batsman Amita Sharma and a disciplined performance by the bowlers helped Indian women beat West Indies by 57 runs in the final ODI and clinch the series 3-2. India eves survived a late burst from Mohammed and Selmaneked to carve out a 10-run victory over West Indies in the second one-day international. England defeated Australia by seven wickets to win the third and final women's one-day international at the WACA Ground in Perth on Sunday. Indian players retained their numero uno status in the ICC ODI women's rankings with Mithali Raj leading the batting chart and Jhulan Goswami heading the bowling list. New Zealand's women booked their place in the semi-finals of the World Twenty20 with a comprehensive 47-run victory over Sri Lanka at Basseterre. Jhulan Goswami's India have put its campaign at the ICC World Twenty20 2010 back on track after defeating Pakistan by nine wickets in a one side affair. 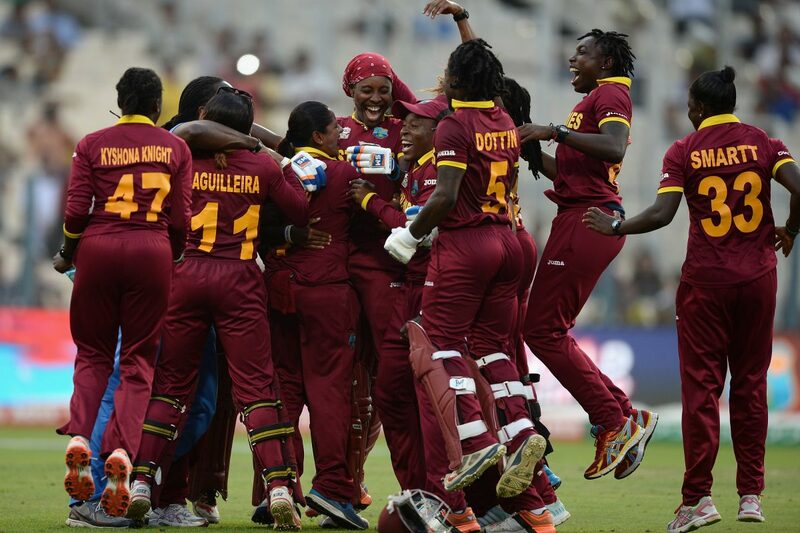 The West Indies sealed its place in the semi-finals after defeating reigning champion England by just two runs. Australia women has moved closer to securing a place in the semi-finals of the ICC Women's World Twenty20 West Indies 2010 after victory over South Africa at Warner Park.